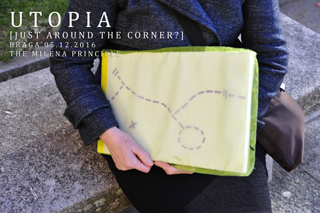 Curator Artemis Potamianou [MOMA NY & Tate London UK] invited the Milena principle at Art Athina 2014 (and 2015). As an independent art platform we distinguishing ourselves by working on unconventional ways and by establishing unexpected and nomadic debates on art. [source: Artimis Potamianou Art Athina 2014]. 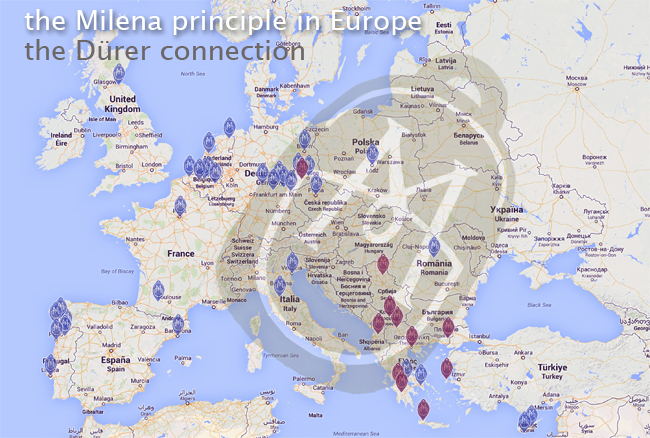 the Milena principle is a 'think tank' with a global vision in which people from several European countries come together. The group is made up of artists and experts from various domains and disciplines including science, alternative health therapies, literature, art history, sound art and music, architecture, technology and philosophy. 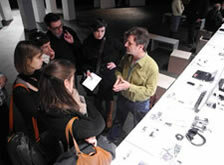 We work as an European organisation and we realized art events in countries all over Europe. Within the projects of the Milena principle various international artists, writers, scientists come together and cooperate, create with a multi- and interdisciplinary attitude and reflect about the border crossing aspects of culture, art, science, ecology and health. 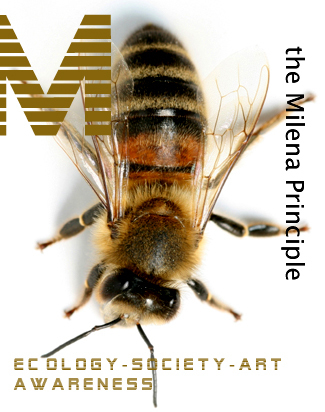 One of the important aspects of the Milena principle members is their individual research in various fields such as art, philosophy and science. the Milena principle wants to invest in Human Capital. 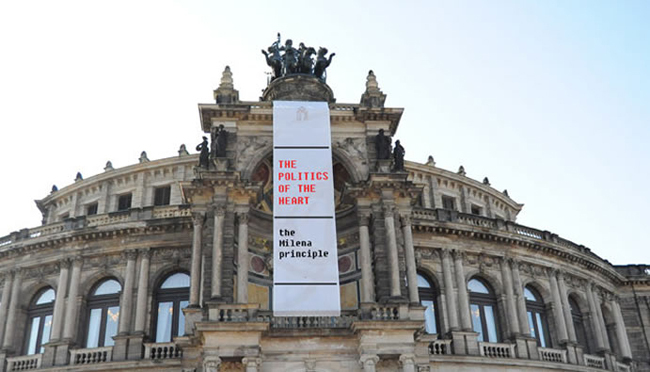 the Milena principle organized a variety of artistic and cultural events connecting people throughout Europe in the last decade. We built a network of international partners in more then 15 countries, including private persons, cultural institutions, universities and museums, all established through personal contacts. The majority of activities were realized on basis of voluntary work of our team and international partners, with no or little money nor governmental help. Our events are processes, laboratories of a feeling thinking in which instruments of art are as well instruments of science and knowledge. 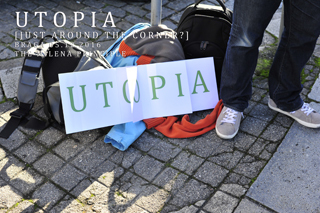 It are human fields, artistic pop up events, meeting places in an intimate atmosphere open to participation of the public and community. A humanist attitudes merges as well with an artistic one. We refer the nomadic aspect of renaissance artists, who did not only travel with their work through Europe but also made connections with all the places they visited. Renaissance artists, scientists and philosophers found each other via their common interest for a new philosophy. Through exchanges of ideas with artist and friends, whom they visited during their continuious journeys, they created a network of solidarity and affinity. Our art projects have an explicit utopian and human dimension. Albrecht Dürer [1471-1528] visited the Netherlands and Flanders [Antwerp in 1520]: the Milena principle wants to actualize this old tradition. These great renaissance persons found each other via their common interest and thinking. Through their travels they moved boundaries, they travelled with and via ideas. Through exchanges of ideas with artist friends, whom they visited during these long journeys, they created a network of solidarity and affinity. All events are linked with 'the Dürer connection', a guideline within the projects of the Milena principle, referring to the nomadic aspect of renaissance artists, travelling with their work through Europe and making connections with the places they visited and with the people they met. Renaissance artists, scientists and philosophers exchanged ideas on a border crossing way and in an atmosphere of friendship, during mutual visits on their continuous journeys. Our art projects connect explicitly with this European, utopian and human dimension. 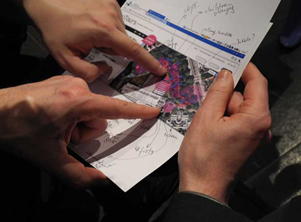 the Milena principle focuses on the ongoing travelling project "the Dürer connection" (2003 - ), developing itself as an European nomadic network, initiating collaborative encounters between public, experts and artists, referring to the Flemish renaissance, when artists, philosophers and scientists traveled unceasingly, connecting with people and places. The projects refer to this utopian and human dimension, with traveling as an artistic instrument, with events and exhibitions realized in Germany, Holland, Portugal, Poland, Spain, Italy, Czech Republic, Romania, Austria, Serbia, Slovenia, Bosnia and Herzegovina, Albania, Kosovo, Macedonia, Greece, Crete, parallel events in Latin America, as well bringing artists and people from many European countries to Belgium.